Tungsten Carbide(cemented carbide) is a hard alloy made from refractory metals and metal bonding through the powder metallurgy process. Tungsten Carbide has high hardness, wear resistance,good strength and toughness, heat, corrosion resistance and a series of excellent performance, especially its high hardness and wear resistance, even at 500 ℃ temperature also remained unchanged , At 1000 ℃ is still very high hardness. Tungsten Carbide has a high hardness, strength, wear resistance and corrosion resistance, known as "industrial teeth" for the manufacture of tungsten cutting tools,tungsten carbide micro drill,tungsten carbide tile cutter,tungsten carbide cutter insert, tungsten carbide ball,tools, cobalt and wear-resistant parts, widely used in military, aerospace , Machining, metallurgy, oil drilling, mining tools, electronic communications, construction and other fields, along with the development of downstream industries, Tungsten carbide (cemented carbide) market demand continues increase. And the future high-tech weapons and machine manufacturing, cutting-edge scientific and technological progress and the rapid development of nuclear energy, will greatly enhance the high-tech and high-quality stability of the demand for tungsten carbide (cemented carbide) products. Tungsten Carbide cutting with a cutting speed 4 to 7 times higher than high speed steel, tool life with 5 to 80 times higher than tungsten carbide cutting tool. 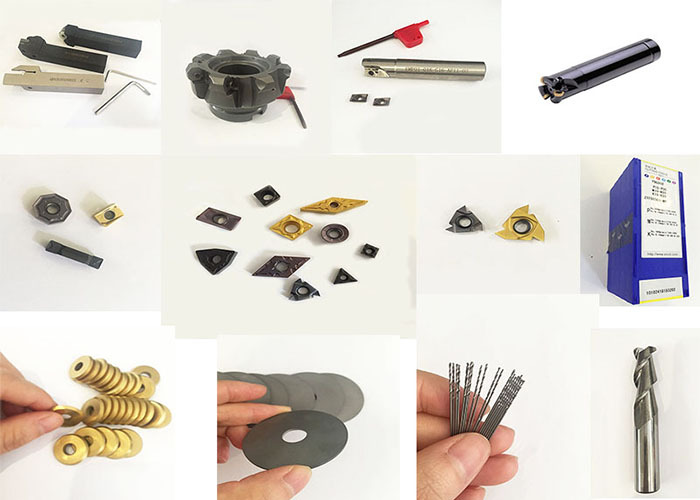 However,tungsten carbide with high brittleness, can not be easy machining, it is difficult to make into solid tungsten carbide tool with complex shape, thus often be made into different shapes of the tungsten carbide blade,use welding, bonding, mechanical clamping and other methods installed in the tool holder,cutter body or mold body . Tungsten Carbide（cemented carbide） is widely used as cutting tool material, such as turning tools, milling cutters, planers, drill bits, boring knives, etc. It can also be used for cutting cast iron, nonferrous metals, plastics, chemical fiber, graphite, glass, stone and ordinary steel. Heat-resistant steel, stainless steel, high manganese steel, tool steel and other difficult process materials.